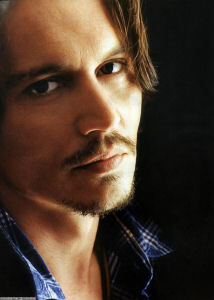 He refuses to play up his leading man looks, but that’s only partly why Johnny Depp is this year’s choice. There he was in Disneyland last summer, strolling through the park with his girlfriend and their two children. They were any family: the 4-year-old girl with her face buried in a cloud of cotton candy, the 20-month-old boy asleep in a stroller. But onlookers who caught a glimpse of the drop-dead features beneath the slouchy hat and dark glasses probably did a double take. The family guy was Johnny Depp, out introducing his kids to Pirates of the Caribbean, the theme-park ride that inspired the year’s biggest non-animated blockbuster and catapulted his art-house career into the bright, shiny mainstream. After spending a lifetime rebelling against the Man, Depp has been tamed, at 40, by the Mouse. Settled in a medieval-style house in L.A. and a second home on the French Riviera with his girlfriend of five years, French actress and pop singer Vanessa Paradis, 30, and a little Lily-Rose and Jack, Depp remains a man of contradictions. “He’s a real trash-food guy, he likes Big Macs—but he also knows a good bottle of wine,” says his longtime friend, director Jim Jarmusch, who adds that this A-list movie star “gravitates to outsiders and people that are down-and-out.” And of course, Depp is famous for being the best-looking actor to hide under layers of hats and blankets in his private life and behind oddball characters in his films. Heeeere’s Johnny! Unhappy at his heartthrob status after playing an undercover cop on FOX’s 21 Jump Street, Depp devoted his career to playing weirdos, from 1990’s Edward Scissorhands to this year’s raffish Captain Jack Sparrow in Pirates. Deconstructing Depp—The bits and pieces add up to a true original. Around his neck Depp wears a tiger tooth, a polished stone, a Che Guevara charm and an Egyptian amulet. He sports two silver skulls and a gold Cherokee head that reflects his mom’s heritage. The leather cuff is modeled after the one he wore in Platoon. The plastic chain was made by Lily-Rose. 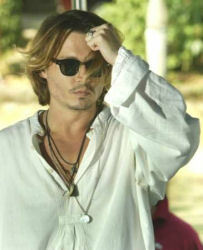 Depp’s a repeater, and he favors well-worn clothes. For a recent premiere, he wore a vintage pinstripe suit and spectator shoes. An American Boy . . . ‘I am an American. I love my country and have great hopes for it. It is for this reason that I speak candidly and sometimes critically about it. I have benefited greatly from the freedom that exists in my country and for this I am eternally grateful’—From a statement issued by Depp in September after a German magazine printed controversial comments he had made about the U.S.
Women of His Past Passion? That’s an understatement. The heat was on with these former flames. Sherilyn Fenn ’84 to ’88—Depp had her name inscribed on his helmet in Platoon. Jennifer Grey ’88 to ’89—The pair got engaged only two months after meeting. Winona Ryder ’89 to ’93—She inspired his famous “Winona Forever” tattoo. Kate Moss ’94 to ’98—He memorably trashed a New York City hotel room after a fight.